Who else feels that Valentine’s Day has become too commercial? Hands? Anyone? Well, I do, which is why my hubby and I often go handmade for our Valentine’s Day gifts. Today I’m joining some of my fellow Canadian bloggers to bring you DIY inspiration for injecting some handmade style into this lovey-dovey holiday. 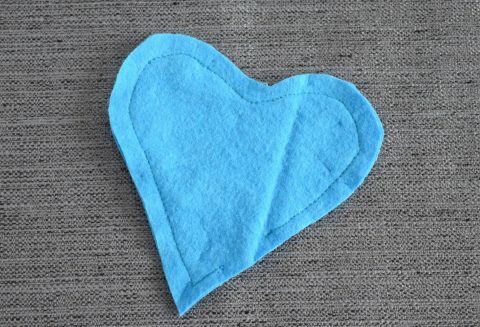 If there’s one thing that we Canucks know, (you know, other than hockey and universal health care) it’s COLD WEATHER, so I thought it would be nice to make a few DIY hand warmers as a little Valentine’s Day gift. 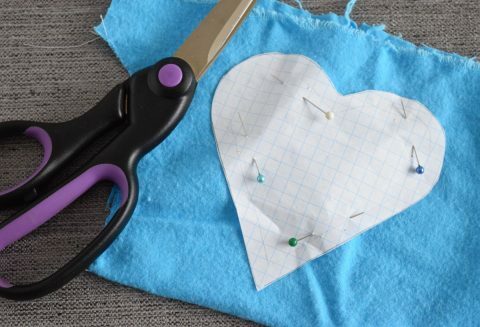 These are really easy to make in case you are looking for great beginner sewing projects! Today’s hop is hosted by Jo-Anna of A Pretty Life in the Suburbs. Jo-Anna blogs from Calgary, Alberta, and she has lots of great home decor, recipes, and DIY projects on her site. Stick around to the end of this post to visit all the other lovely participants’ blogs! 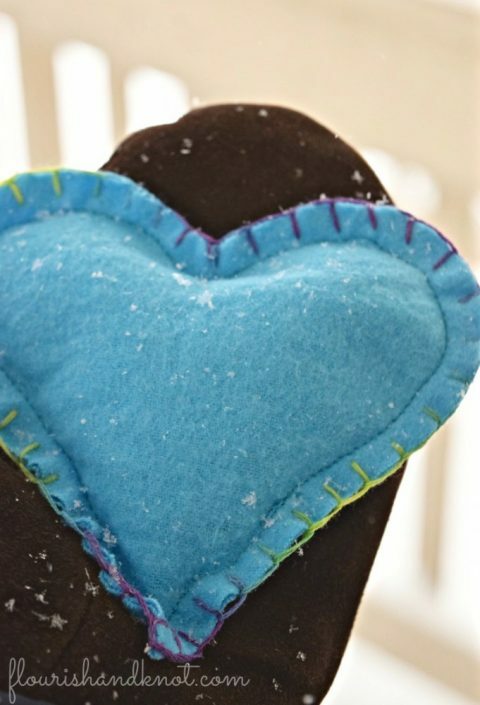 These hand warmers are a perfect sewing project for beginners. You can even hand-sew them easily if you don’t have access to a machine! And the stitching on the edge is just a plain blanket stitch. I’ll show you how to assemble them in no time. Cozy fabric – I used a turquoise flannel, but soft cotton, polar fleece, or felt would work! Cut out your hearts – you should have four heart shapes now. 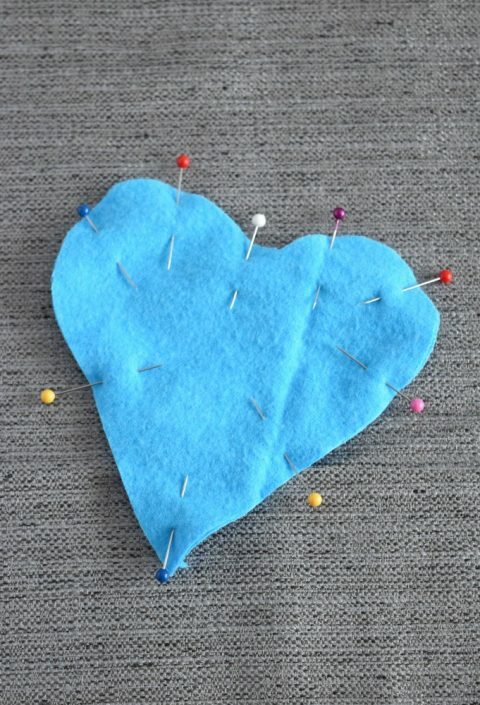 Pin two heart shapes together. 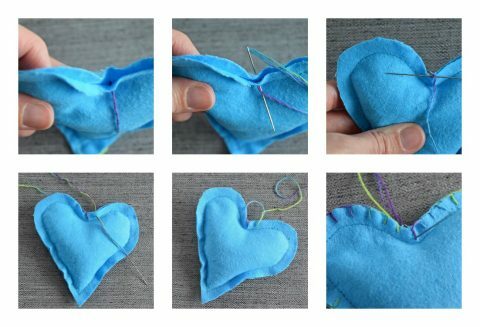 Sew a 1/4″ seam around the heart. 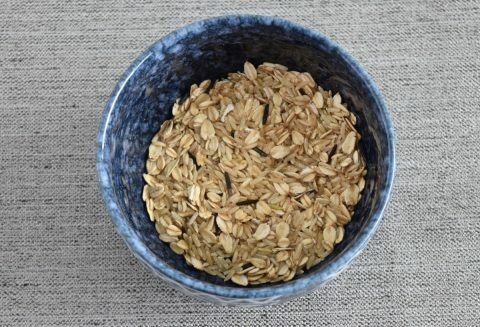 Leave a 1″ opening (so that you can fill it with the rice and oatmeal). Fill the heart with the rice and oatmeal blend. 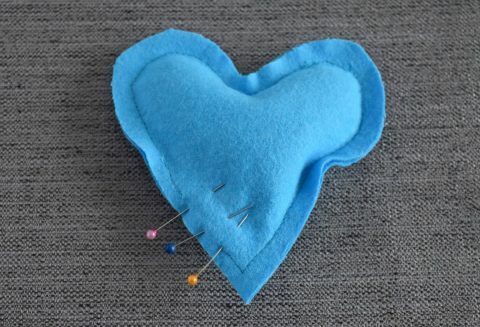 Pin closed and sew up the heart. To heat your hand warmers, place them on a dish in the microwave and microwave them on medium-high for 1 minute, turning the heart after 30 seconds to heat through. Watch out: they get VERY hot! (Consider this your friendly don’t-sue-me-because-you-didn’t-listen-to-my-instructions warning.) 😉 They should stay warm in a mitten for 20-30 minutes. I’m having trouble getting the presser foot on my sewing machine to engage properly (hence that slight squiggle in my seam) and cannot seem to find a solution! Anyone out there have an Elna and can help?? I’ve had it looked at by a repairman, but there’s still a problem. I have some big projects to do this winter, so I’m getting kinda desperate. You can find some of my other sewing projects HERE! Now I hope you’ll take time to visit the other Valentine’s Day hop participants! There is some fantastic inspiration for DIY projects! These are adorable and perfect for our cold winters! I need to make these! It’s so cold here. This is such a sweet idea! My kidlets would be thrilled with hand warmers during the cold snaps we’ve been having. Love it! Yeah, I feel like these will make great waiting-for-the-bus gifts someday! I thought these were the cutest warmers ever! These are so great! I have to get my daughter working on making some of these with me. It’s sooo cold right now! I’m really liking the idea of homemade gifts too. Ugh, from what I’m reading of the weather, I am not looking forward to coming home from Mexico! 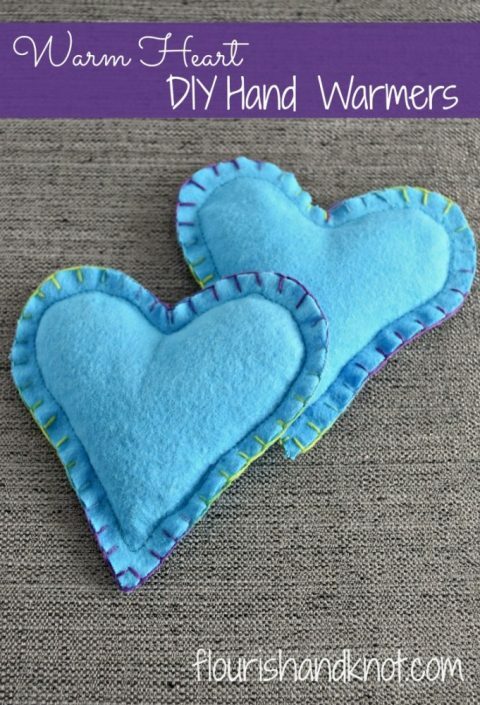 I am so going to get my kids to make these as they’re always asking for sewing crafts! Yay for kids that sew!! We don’t exchange gifts for Valentine’s day… but I do love seeing all of the different ways people create some Valentine’s fun on zee web. These hand warmers are adorable! We don’t really do gifts either – these warmers actually went to my sister-in-law, who is moving to Canada in a few weeks!! Sometimes we make little thongs or a nice meal, but we feel it’s just become too commercial. What a sweet idea! I had no idea that you could use rice and oatmeal for a hand warmer. The rice really holds the heat and the oatmeal smells great! Anything that’s warming in the winter is good in my books. Cute heart shapes too! These would make a sweet gift topper. And what a perfect way to use up scrap pieces of fabric too! I’m a big fan of shopping my craft stash for stuff to use up. Such a sweet little project, and so, so perfect for this time of year. Any Valentine would love it! Well these are cute! I make a similar version using rice. I’ll have to try oats next time. I found that the mix of rice and oatmeal held the heat well but also smelled great! I LOVE these! A craft that can easily be personalized is so dear to my heart. I’d love to throw these into my slippers- heaven! Oooh putting them in slippers or shoes: brilliant! These are adorable! My daughter has been looking for a simple sewing project. These would be perfect. I’m so glad she’s inspired to sew!